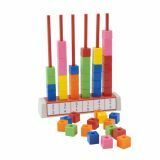 This abacus incorporates colors and geometric shaped solid blocks. 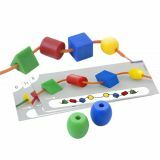 This toy supports both physical and intellectual development; such as improved attention and logical reasoning. 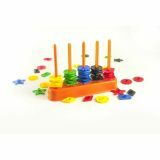 The solid blocks help to improve dexterity. This item also has a free digital component found on playminiland.com where you may find lesson plans and downloadable/printable activity cards. You may also access an online game that complements this toy. Geometric Disks / Stacking & Sorting. 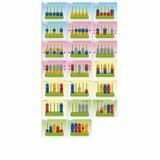 This abacus has 5 columns and an assortment of 10 different geometric-shaped disks in different colors. 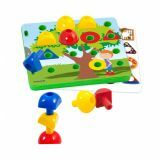 This toy includes activity patterns that promote eye-hand coordination as well as logical thinking skills through stacking and sorting the pieces. This plastic abacus is composed of 6 columns and 90 cubes. 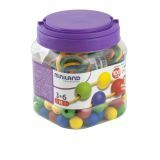 It teaches the concept of numbers and basic math operations. It is very versatile – the pieces can be taken apart and re-configured. 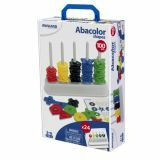 This abacus has 5 columns and an assortment of 10 different geometric-shaped disks in different colors. 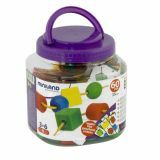 This toy includes activity patterns that promote eye-hand coordination as well as logical thinking skills through stacking and sorting the pieces. This item also has a free digital component found on playminiland.com where you may find lesson plans and downloadable/printable activity cards. You may also access an online game that complements this toy. Big buttons with 1 to 5 holes in bright colors. 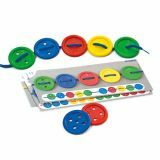 Ideal for sequencing and sorting, as well as developing mathematical and motor skills. Each button has a number in relief and its equivalent Braille symbol. The set includes individual activity worksheets and 5 – 3.28 ft. long laces. Fun way to learn essential math skills about money. This game includes actual size and accurately designed play money. Each set includes 3 games in a series of 6 cards each – total of 18 full color cards. 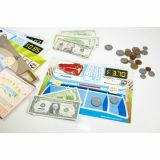 The activity cards help to develop the following math skills: Visual discrimination and sorting, visual recognition of the currency, association of the values to the coins and bills, quantity comparisons. Each series is identified by a color code: Blue series = “dollar bingo": visual recognition of Dollar coins and bills. Green series = “market game": breakdown of bills and coins making up a given price. Red series = “I buy"game: comparing the value of coins and bills with the notions of “greater than" and “less than".This item also has a free digital component found on playminiland.com where you may find lesson plans and downloadable/printable activity cards. You may also access an online game that complements this toy. 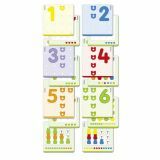 This is an excellent basic math game designed to boost concentration, attention and eye-hand coordination: vertical sequencing, spatian orientation exercises and logic game. The pegs have 3 basic geometric shapes: circle, square and triangle in 3 primary colors: red, blue and yellow. Included are 12 activity mats labeled with number, color and shape outlines. Also included is 1 foam flexible board to overlay the activities mats, place and stack pegs and then lace through the pegs. Stringing game that promotes ocular-metrical practice and co-ordination. 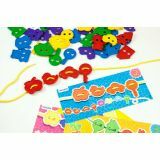 It has 5 different shapes, 1 metre long plaited cords and a collection of various activities on individual cards. Available in 2 sizes, 2,5 and 3,5cm. and in several different presentations with different numbers of pieces. Made of solid plastic. Included are 5 different shapes, 3.28 ft long braided laces and a collection of cards with different sequencing classifications and linking exercises. Presented in a practical, reusable clear container. Included are 3.28 ft. long braided laces and a collection of cards with different sequencing illustrations, classifications, and linking exercises. Both ends of the lace are plastic coated to facilitate threading.